We are a leading Authorized Retail Dealer of Suzuki Qzarks 250 ATV Bike and Suzuki Quardsport Z400 ATV Motorcycle from Kadapa, India. Four simple words. Seemingly worlds apart. Yet joined by one remarkable machine. Practical and at home on the farm, the ranch, the job site. Convenient to use with electric start, an automatic clutch, a five-speed transmission with reverse. Delivering good value with great features and a proven, low-maintenance design. Ready for fun when the work is done. The Suzuki OZARK 250. Waiting for you. Picking a path up a rocky desert canyon? 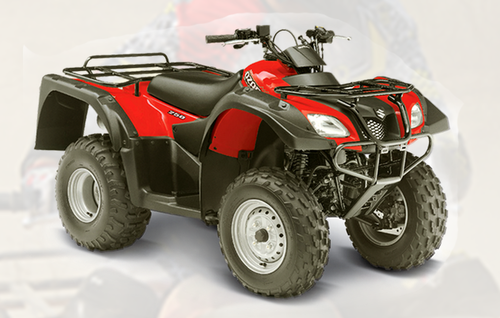 Engineered for fun, the QuadSport Z400 stands ready to transport you to such moments with torque-loaded performance, sporty chassis and an aggressive styling.